Written by: Breanna Turman on July 3, 2017. 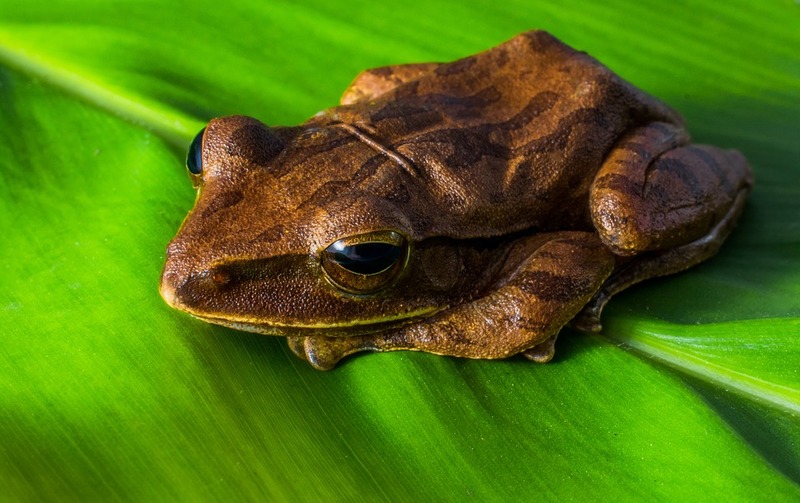 Frog slime, although gross, might help combat some strains of the influenza virus. Got the flu? Time to start looking for your frog prince. Researchers at Emory University have identified a substance that kills influenza, the virus that causes seasonal flu. The influenza-killing substance, called urumin, is produced on the skin of the South Indian frog and stops influenza virus growth by causing the virus to burst open-think of smashing an egg with a hammer! Researchers think urumin disrupts a structure on the outside of the virus. Influenza, like an egg, has an outer shell that protects the contents of the virus- the “yolk”- which the virus uses to grow and replicate. Unlike an egg, the outer shell of influenza is not smooth. Instead, it contains small spikes. Urumin sticks to these influenza spikes, interfering with their function and causing the virus to burst open. The influenza virus uses the spikes to stick to human cells and cause infection. 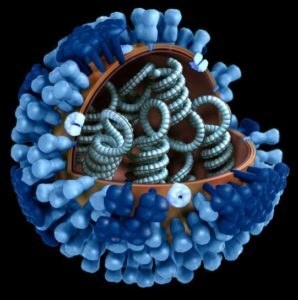 Two types of spikes are found on each influenza virus, H and N. There are multiple types of H’s and N’s, and each virus picks one H and one N to “wear” on its outer shell, similar to the way we choose a pair of pants and shirt to wear every day. Cartoon of Influenza. The outside is covered in spikes, H in light blue and N in dark blue. The coils in the center contain the genetic information or “yolk” that causes the virus to replicate. From: Doug Jordan. Surprisingly, urumin is only effective against viruses containing the H spike type, H1. This is because urumin can only stick to H1 spikes, not to N spikes or to other types of H spikes. H1 is one of only 3 types of H spikes known to infect humans. Shockingly, H1 viruses are responsible for some of the worst flu outbreaks in history such as the 1918 Spanish flu pandemic that caused 50 million deaths and, more recently, the swine flu pandemic of 2009. Destroying influenza in a lab environment is great, but what about in a living animal? In the same study, urumin treatment resulted in a 250% increase in mouse survival after influenza infection. Urumin treatment also decreased disease severity by lessening weight loss and decreasing the amount of virus in the lungs. Although these mouse experiments are promising, it is important to point out that the mice were given urumin 5 minutes before they were infected with influenza and also received urumin everyday for the rest of the infection. Because most of us do not know the exact moment we are exposed to influenza virus – the grocery store? the breakroom? the gym? – it is difficult to treat someone at the moment they are infected with influenza. Thus, more research is needed to look at the effectiveness of urumin when it is given days after infection, which is the typical time that an infected person might visit their doctor. With more research, urumin could be the promising new influenza drug researchers have been looking for, to potentially reduce influenza-associated deaths and complications. This entry was posted in Blog, Feature Article and tagged Biology, Influenza, Microbiology, Science Communication Series, Science News by Breanna Turman. Bookmark the permalink. Breanna is a fourth year graduate student in the department of Microbiology and Immunology at UNC-Chapel Hill. Her research is primarily focused on the virulence mechanisms employed by Chlamydia to cause disease in the female reproductive tract.